Histo- comes from the Greek word for loom or web, and -gram means anything written or drawn. In the wool industry the word histogram has come to mean the permanent record of the quality of an animal's fiber production, as represented by samples of fiber and the statistical information derived from them. 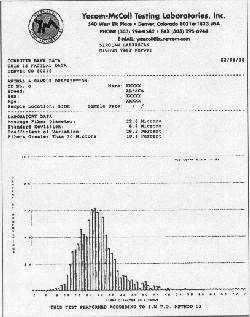 A histogram can be anything from an actual fiber sample taped into a notebook or a high-tech laser-scan printout with its neat little vertical bar graphs. The graphs illustrate the number of fibers at specific micron measurements in a given sample as well as measurements indicating variability within a sample. A typical histogram, incorporating laser scanning of hundreds of individual fibers, contains information about average micron as well as the standard deviation (variability in a fleece) and the coefficient of variation (another measure of variability). The laser-scan histogram is very much a part of the evolving alpaca business in North America. Histogram results are used either to accept or reject inbound alpacas that are candidates for inclusion in the Alpaca Registry. And histograms are often affixed prominently to clipboards on the pens of animals being displayed at shows or sales at numerous venues across North America. At such events a histogram is transformed from an internal document that assists in the phenotypic assessment of an animal to an advertisement that attests to the animal's fiber quality. Used as an advertisement, the histogram assures prospective buyers of the alpaca's competitive fiber-producing powers. The unverifiable assumption of any such histogram is that it actually represents the animal it claims to represent. I would wager that most breeders listen to their consciences and submit samples for testing that are from the animal they say it came from. But because histograms have become an advertising statement, it is important to note that the testing laboratory merely tests samples and has no method of matching a sample to a particular animal, other than relying on the information provided by the sender. Relying solely on a histogram has its limitations. For this and other reasons, learning how to assess fiber quality through visual and tactile means makes good sense for anyone seriously considering entering the alpaca business. While many North American breeders embrace the security and certainty that histogram results appear to offer in assessments of fiber quality, in South America (even among those with the means to use histograms) the traditional, highly refined tactile method continues to be relied upon. Peter Kothe, formerly Michell�s top raw fleece buyer in Arequipa, Peru, says, "The alpaca processing business relies on the fingers of the women who sort our fiber." The officials overseeing the recent International Camelid Festival in Arequipa felt strongly enough about this method of assessment to politely forbid North Americans attending the festival from taking fiber samples from champion alpacas for laser -scanning purposes. The point was well taken: What good would come of a scientific test by a bunch of gringos of animals whose owners could never afford such a test and who have relied on tactile testing for centuries? The sensory experience of high-quality alpaca fiber is unquestionably a distinguishing aspect of alpaca's special appeal to natural-fiber aficionados, especially those who have developed the skill to tactilely assess it. Still, the technology of laser scanning affords an objective insight into fiber production not available until relatively recently. There's no question that a histogram analyzing a sample of hundreds of fibers is a valuable tool for the serious breeder and a convenient aid for the novice who is "tactilely challenged" and unable to distinguish between steel wool and a vicu�a garment. It doesn't take long for the newest novice to learn the histogram sales pitch: the lower the micron count, the lower the standard deviation; the fewer the microns over 30, the better the fleece. If an animal's micron average is low, the seller usually makes a quantum leap to claim that the entire animal is superior. North American alpaca breeders are often asked, "What is a good micron count?" When the author ran a histogram on a sample taken from a vicu�a (the probable wild progenitor of the alpaca), its incredibly fine fleece registered an average of 12.5 microns, with a standard deviation of 4.2 and 1 percent of its fleece in excess of 30 microns. That's right - even the guard- hair was fine, less than 30 microns. The staple was about 1 inch (2.54 cm). An impressive alpaca histogram may have an average micron of 20 or below with a standard deviation of around 3 and a coefficient of variation of 16, with 1 to 3 percent of the sample exceeding 30 microns and indicating that the animal is capable of annually producing a 6- to 8-pound fleece. But there is much more to a histogram than numbers alone, and some important measurements, such as staple length and fleece weight, rarely find their way onto a histogram. As for the much-talked-about micron count and standard deviation, it is important to remember that as long as fiber is still attached to an alpaca it is not a static medium. For example, a 10-year-old male whose micron count has crept up to an average of 30, but with a standard deviation of 4 and a coefficient of variation of 15, and producing 6 to 8 pounds of fleece annually is also very good for breeding purposes. When evaluating a histogram, one must always try to also understand the many environmental factors (diet, testosterone levels, age, pregnancy, stress, and so forth) that affect a fleece (and the histogram) as the animal matures. This latter example of the older male is just one instance of the many factors affecting histogram results. Angus McColl, owner and director of the nationally and internationally recognized Yocom-McColl Testing Laboratories, is quick to explain that while the histograms his laboratory produces are valuable information for the alpaca breeder, each histogram needs to be considered in its own special context. "Histograms should be compared to other animals in the same herd of the same age," Angus says, "not against an animal living on a different diet and of an entirely different age group." Angus notes that occasionally people will send in fiber samples in the hope that the results will give them a marketing advantage over their competitors. To give histogram results greater authenticity and integrity, Angus requests the age of the animal and its ARI registration number, which are included on the histogram. Identifying an alpaca and recording its age allows a knowledgeable person scrutinizing a histogram to get a sense of how a particular animal stacks up against others in the same age bracket. In addition, a potential buyer can supply the registration number to the registry to verify the animal's age. Complete histograms include a test date, which is also helpful. 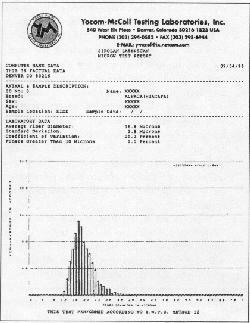 If age and registration number are not included on the histogram, the test result's worth as an advertisement is greatly diminished. Only a few researchers have recorded how alpaca fiber changes under various environmental conditions. George Davis of AgResearch in New Zealand reported at the Australian Alpaca Association's International Alpaca Industry Seminar in 1994 that the fiber of a group of alpacas grazing on nutritious year-round pasture increased on average about 3 microns a year, and individual animals had increases exceeding 9 microns. Recent tests conducted by the Alpaca Registry have shown that diet and other factors can drastically change histogram results in a matter of a few months, even more dramatically than those recorded in New Zealand. In 1997 this ARI screener was afforded the opportunity to test a group of twenty-one alpacas (ten huacayas and eleven suris) on two occasions four months apart during a period of radical dietary change. The results demonstrate that some aspects of alpaca fiber measurement commonly recited on a histogram are easily altered, while other measurements remain relatively constant. In the test group the first fiber samples were collected shortly after the alpacas had been transported from the altiplano at the end of the dry season, when natural pastures are nutritionally depleted. All animals were sampled at the midpoint along the flank of the primary blanket. The animals in question arrived in relatively good body condition, with most scoring 2 or 3 on a 5-point body score (Table 1). Most of the animals were tuis, in full fleece and not yet finished growing. By definition, tuis produce the best-quality fleece each animal will ever produce because it is the animal's first fleece. This group of tuis was shorn immediately following fiber sampling. To maximize their growth potential, the animals were introduced to a high-protein diet of unlimited amounts of high-grade alfalfa and a carefully regulated grain/pellet supplement. Four months later fiber samples were collected from twenty-one of these animals (ten huacayas and eleven suris). In the 4-month period between the original sample and the second sample the animals had gained between 10 and 20 pounds (22 and 44 kg) and appeared to be robust and in excellent health. Alpaca ID # Avg. Fiber Diam. Incr. Actl. Micr. Incr. SD SD after 4 mo. SD Incr. % over 30 Incr after 4 mo. Incr. CV% CV after 4 mo. Though they had experienced rapid weight gain, none of the alpacas was obese. All generally received a body score of 3 (optimum) on a 1-to-5 scale. Some had grown an inch (2.54 cm) at the withers. The weight gains in such a short time were no less remarkable than the changes in their histogram results during the same period. As a group they experienced an increase of 3 microns in diameter, moving from an average of 21.8 to 24.8 microns, with an individual animal skyrocketing 9 microns in four months. The percentage of micron counts over 30 in the sample increased by a whopping 10.7 percent, from 6.7 percent to 16 percent. On the other hand, standard deviation (SD) and coefficient of variation (CV) proved to be much more stable measurements under the changing conditions. On average, standard deviation shifted upward by only 1 micron. Coefficient of variation was practically as stable, showing a mild upward movement. Both measurements assess uniformity (consistency), which is directly related to hair follicle development on the skin, a characteristic primarily influenced by inheritance. Thus, these two measurements are usually less influenced by environmentally stimulated changes than micron count is. By and large, most test results of samples taken by ARI during the screening process are very similar to the results of pretests conducted by importers. However, on occasion, an importer will challenge ARI�s results on some animals, claiming that the same laboratory performed the tests and therefore the tests should yield the same results. In many cases, dietary changes will account for the differing results. There are other reasons for disparate results. In some cases the importer collected samples haphazardly. One common error is to take samples at varying places along the staple. For example, some sample cuts may be procured 2 inches from the skin while others are near the skin. Another common error is to collect samples from various sites on the animal rather than the recommended mid-side region. In one case the importer took pencil-sized samples, rather than the 2 - square -inch sample size recommended by Yocom-McColl, so the fleece would still look good. In other situations, recently shorn animals with inadequate staple lengths had been sampled. ARI samples all animals in the same manner, from the mid-side area of the blanket. The sample is procured from as near the skin as is possible with portable electric shears. To do it any other way would result in inconsistency, which should be avoided in order to obtain accurate results. It is worth remembering that the micron thickness of individual fibers along the staple can vary up to 9 microns if the alpaca has undergone a significant dietary change during the 12-month fleece-growing period. Consequently, if a sample is taken an inch (2.54 cm) from the skin, the result may be significantly different from that of a sample taken close to the skin. In fact, procuring a sample one-half inch (1.3 cm) along the staple from the skin may result in a difference of 5 microns, depending on numerous environmental factors that the animal may have experienced. There is no doubt that micron counts will likely increase with a richer diet, but that is not always the case. Of the twenty-one animals in the ARI study, five increased in microns only slightly and two actually decreased ever so slightly in average microns, even though the animals rapidly increased in body weight. Micron reductions from stress and diet are well documented, but the genetic predisposition of some animals to change to a richer diet without appreciable effect on their coat fineness is not understood. Alpacas whose dietary intake does not appreciably alter their average micron count will undoubtedly attract the attention of breeders and researchers in the years to come. One alpaca born in California as a third-generation product of a North American breeding program of Chilean ancestry is one such example. For reasons not understood the animal defied an enriched diet, aging, and multiple shearings. The alpaca averaged 19 microns at 18 months of age with a standard deviation of 3.4. Four babies, five shearings, and six years later its micron count hadn�t changed. Why? ARI also conducted tests to attempt to determine how much variability existed within a fleece. Most people know that the skirting, bib, and, to varying degrees, the neck can be counted on to be coarser than the primary fleece or blanket area. ARI focused its variability assessment on the blanket area. This was done by sampling the same animal in different sites on the blanket at the same time. Samples were always procured along the skin. This ARI screener took 10-inch-long swatches from the midsection area of the blanket. The sample was then divided into three equal parts and laser scanned. The results showed a great deal of consistency, with most animals showing very slight variability of no more than 0.2 micron. However, two animals showed about 1 full micron of variability in a 10-inch swatch. Tests were also conducted (six animals chosen randomly) in which both sides (at the midpoint) of the same animal were sampled and compared. Again, most animals were consistent to within less than 0.2 micron from one side to the other. However, two animals (one-third of the test group) showed a difference of nearly 1 micron from one side to the other. Today, most of us in North America are unlikely to avoid the use of laser scanning, but we should learn to look at test results for what they are: the quality of the fleece at the time of sampling. The value of the test results is that they indicate numerous factors encompassing both the genetic quality of the fleece and numerous environmental variables. 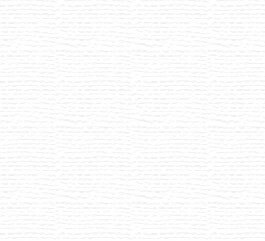 It would be a mistake to rely solely on a histogram to make comprehensive conclusions about an alpaca's fleece and the animal's ultimate value. It takes a thorough education on essential fiber characteristics in conjunction with wise use of information provided by histograms to steer a breeding program. The histograms shown in Figures 1, 2, 3, and 4 provide illustrative examples. This histogram appears to indicate a desirable fiber test result. The low micron count (20.8 microns) coupled with a low standard deviation (3.2) is very desirable, as is a coefficient of variation of 15. But the age of the animal at the time of the test needs to be considered as well. Assuming the birth date is accurate, the animal was about 11 months old at the time of the test , which is young when compared to a tui (18-24 months), the age group most commonly sampled and shorn for the first time. The fiber of an animal sampled this young will likely coarsen by a few microns by the time of first shearing. The animal's diet in the months prior to testing and comparative data of other animals would help in the assessment of this histogram. Information necessary for a full histogram is also missing. The owner failed to provide the alpaca's Alpaca Registry Identification Number, which may mean an animal so casually identified may not necessarily represent the sample shown in the histogram. Because the animal isn't precisely identified, any additional information sought from the registry cannot be retrieved, nor is there any verification that the animal is actually registered. In addition, this test lacks the "fibers greater than 30 microns" score, which indicates the prickle factor. The prickle factor and presence of guardhair are carefully monitored in all luxury fibers , not just alpacas; fiber processors generally agree that microns over 30 irritate human skin, hence the name prickle factor. A histogram with favorable results , such as this one for a tui, would identify a truly superior animal if the fleece weight were 7 to 8 pounds. This test result is favorable in all test areas, although the coefficient of variation is a little high. 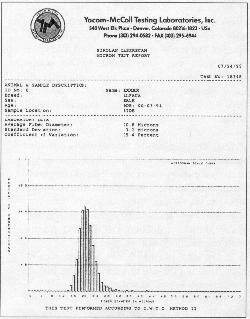 However, the date of the sample and the alpaca's birthdate are not indicated, nor is the Alpaca Registry Identification Number, meaning that this histogram is useful for internal ranch management purposes but unsuitable as a complete histogram for purposes of verifying fiber quality to a prospective customer wanting to purchase the animal. This vicuna (Vicugna vicugna) sample offers a study in fineness, an average fiber diameter (AFD) of 12.5 microns. At an AFD this low, a standard deviation of 4.2 is high, indicating that even though the micron count is very low that sample has a significant amount of variability. The degree of variability is dramatically expressed in the 33.6 coefficient of variation, which testifies to the medullated hair in vicuna fleece that is generally removed in a dehairing process. Still medullated hairs are so fine in this sample that only 1 percent of the sample was over 30 microns, which is superior to most alpacas. Superfine animals such as vicuna and some alpacas often have diminished fleece weights. In vicunas a fleece usually is about 1 pound and regrowth occurs at a rate of about 1/3 inch a year. Annual regrowth of 6 inches and fleece weights of 4 to 8 pounds are common in alpacas. If the owner of the alpaca in this test cited the resulting micron count as desirable, he would be accurate, but that is not the only consideration. The other test results are not favorable for an alpaca of any age. The standard deviation is high for an animal with a micron count this low. This disparity between the average fiber diameter and standard deviation is reflected in the coefficient of variation, the measurement that combines standard deviation and micron count. A coefficient of variation near 20, and preferably lower, is desirable. A coefficient of 29.2 is excessive and indicates a great deal of variability in the sample. 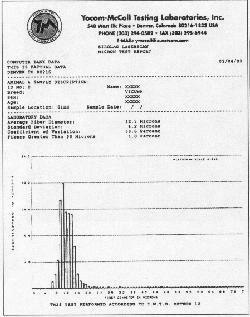 The extent of this variability is further reflected in the "fibers greater than 30 microns" score: 10.4 percent of the fibers are greater than 30 microns, indicating a great deal of course medulated fiber and an undesirable prickle factor. Copyright � 1998 by Eric Hoffman. Site Content © 1998-2004 Eric Hoffman. All rights reserved. No portion of this site may be reproduced or distributed in any manner without explicit written permission from Eric Hoffman. Site Design © 2001-2004 Acorn Arts & Design. All rights reserved.